The beauty and fashion industry has consistently seen success with audiences since its inception. You see it everywhere you turn; from commercials to billboards to social media ads, constant stimulation and evolution is the name of the game. Today, marketing is all about the influencer, and every brand knows it. While the focus of influencer marketing has been placed greatly on Millennials and the generations before them, it’s time to make room for a new generation. This generation doesn’t care to be labeled; they are redefining their world and living on their terms. Meet Generation Z. Below, you’ll find a list of brands and designers who are working their way into the hearts of Gen Zers everywhere. How are these brands getting it right? Take a look below. Olay: This isn’t your mom’s Oil of Olay facial cream. The iconic brand has expanded and introduced the Olay Whip Collection. This is a lighter, more appealing version of facial cream that removes the stigma of Olay as a mom’s brand. Gen Z as a whole enjoys a good thriller. You can see this through their dedication to shows like Stranger Things and Black Mirror. Designers like Louis Vuitton and Chanel are taking note by featuring fashion pieces showcasing images from the likes of Stranger Things and Rosemary’s Baby. Bloomingdale’s is welcoming all gamers. The store’s spring collection featured brightly colored and geometrically designed pieces inspired by Nintendo. For the generation who grew up playing video games, it is safe to say Bloomingdale’s claimed some real estate in the closet of Gen Z video gamers everywhere. The big box retailer, Target, invites Gen Z consumers to explore their Universal Thread Goods Co., which features the perfect type of clothes for the generation that grew up hanging out or “just chillin”. This partnership adopts and encourages the laid-back lifestyle of Gen Z.
Abercrombie & Fitch, which is going by A&F these days, most likely to speak the same language as the generation who communicates in Snaps and emojis, includes Gen Z’s favorite color in their print ads, yellow. If it’s not on their models, it can be seen in yellow retro cars or hidden subtly in the backgrounds of ads and stores. There’s a movement toward romanticism, which is seen in ads from Herbal Essences, L’Oreal, and Jimmy Choo. Wispy and flowery images fill the creative space for these brands looking to appeal to the generation who doesn’t mind letting their hair down. Levi’s is the brand never seems to age, probably due to their willingness to adapt to their consumers. They stayed on trend with Millennials by raising waistlines and are now positioning their skinny jeans as a catalyst for redefining personal style, playing off of Gen Z’s desire for individuality. L’Oreal is connecting Gen Z through artificial intelligence, or AI. Gen Z grew up binge watching makeup videos, and now the cosmetic icon is delivering similar content through Amazon’s Alexa. Thanks to My Beauty Chat, audiences can join editors from Cosmo, Elle, and Harper’s BAZAAR as they discuss beauty tips. Nike decided to toss things up and rethink the way they design sneakers for women. Fourteen female designers were the creatives behind an entirely new capsule sneaker collection. Social Media and YouTube stars are seeing fame that actors and musicians have seen for years in Hollywood. While their strength is digital, brands like Guess, are harnessing their online influence by placing them in ads, collaborating with them on product lines, and launching them to the forefronts of their commercials. This all makes perfect sense as Gen Zers see social media stars as educators and collaborators. Guess did this by partnering with social media star, Amanda Cerny, to create a line of active wear including sports bras, bottoms and tops. As brands and designers evolve with the next generation, you will notice an insertion of the fun-loving and easy-going spirit of Gen Zers. 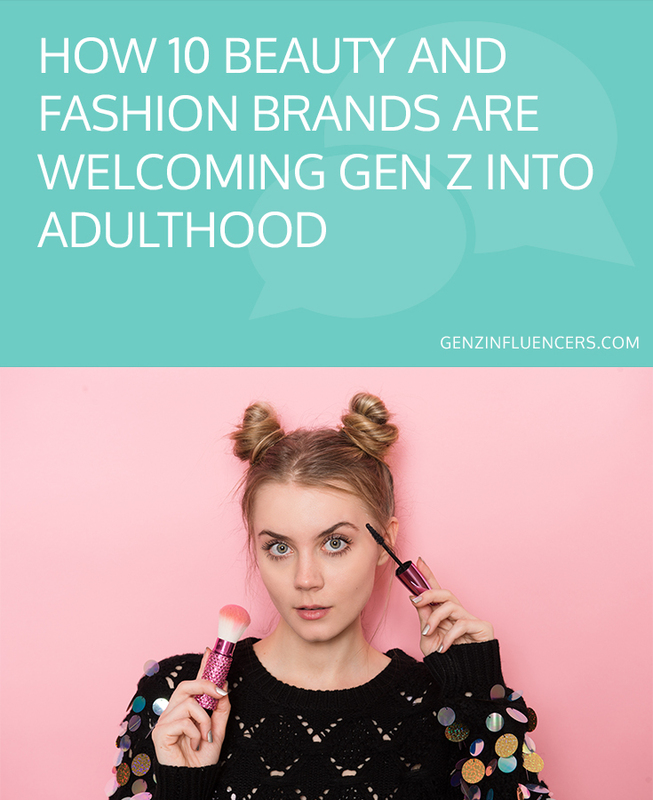 We encourage brands and marketers to be intentional when connecting with this generation of consumers, and our company, Gen Z Influencers, is here to help you along the way. We look forward to adding your brand to the list of those seeing success marketing to Generation Z.